It can be hard to find a great transition shoe. Even when we do find one that has the look we want, it doesn’t have the wearability to get us through a 12-hour day. But we can’t wear our stinky, ratty running sneakers to a party unless we want a permanent spot on the Do Not Invite list. So what to do? Find a shoe that does it all, and for a good cause. Toms Kala wedge booties are the shoes we can trust to carry us through our longest days, all while receiving compliments along the way. They’re a mix of casual, cute and comfort. Check, check and check! We love these so much and we love Toms for always making us feel warm and gooey inside whenever we purchase a pair of the brand’s shoes. Every time someone buys a pair of Toms, a child in need receives a new pair of shoes too, which is our favorite feature of all. 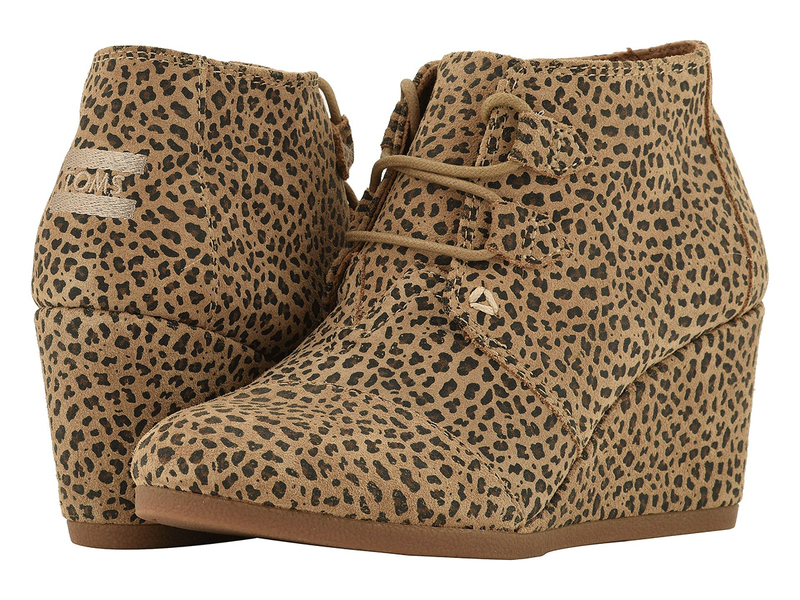 See It: Get the Toms Kala wedge booties (originally $90) starting at $63 from Zappos. The Kala booties are game-changers full of surprises. The first big surprise? The shade options for the soft, suede upper, and the matching, suede-wrapped heel! Black Suede is a deep, dark black all around because everyone needs a pure black bootie. The Forged Iron Gray Suede is a dark charcoal, a full shade up from the Black Suede while still functioning as a shoe that won’t throw off an all-black outfit. Desert Taupe Suede is a sandy beige with a brown sole for a bit of contrast and has a neutral look for successful pairing with any jeans or leggings. The biggest surprise was the Cheetah Suede, which is wonderfully bold! A small cheetah print covers the entire upper of the shoe, which has a slightly darker shade than the Desert Taupe in the background. We actually said “wow” when we saw these. We see you, Toms! A unique shoe such as a wedge bootie deserves both basic and bold options, so this for sure sparks joy within Us. Besides the colors and patterns, we have to applaud the construction of the shoe itself. It looks lovely and it feels even lovelier. These booties are lace-up so we can adjust their tightness accordingly, and they have a lightly cushioned textile footbed that won’t leave our heels and toes throbbing at the end of the day, even with the wedge’s almost-three-inch height boost. Also on the inside is a breathable textile lining to avoid feet-overheat. Back on the outside, the outsole is a durable, but flexible rubber. In other words, these booties were made to last. The fused wedge design is also great for our own durability, as they keep us stable and safe on our feet. The booties are topped off with an embroidered Toms logo at the heel. Very cute, if we do say so ourselves (and we do). With all of these benefits, we were shocked to see the sale prices, especially on the Desert Taupe Suede shade, which is a full 30% off. It’s not always that a five-star-rated shoe gets a discount at all, let alone a substantial one like this! And every single shade is on sale, not just one! Don’t forget that they also ship for free! Kala-lujah! The Kala booties are being reported as true to size and width, but a helpful size guide is available if this is a first-time Toms buy. If so, welcome to the club. We’re so glad everyone made it here and looks super stylish to boot! 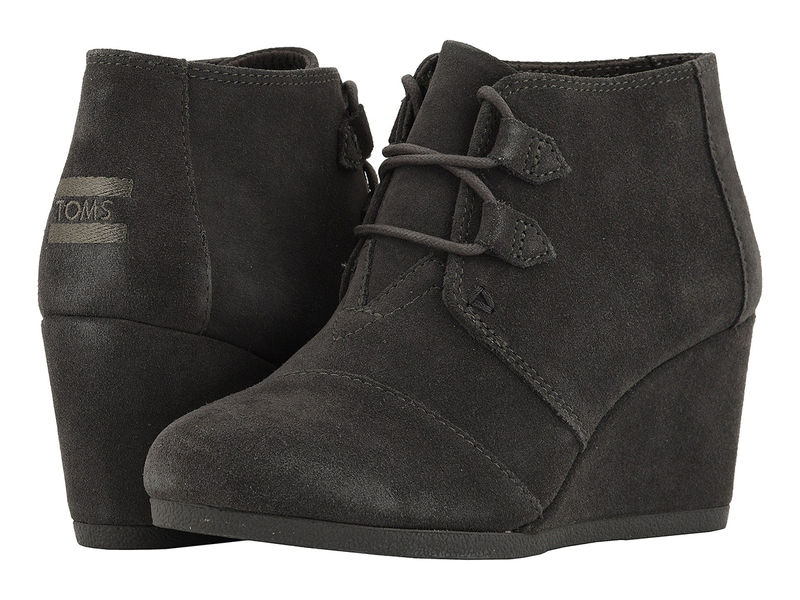 See It: Get the Toms Kala wedge booties (originally $90) starting at $63 from Zappos. Not your style? Check out other boots and booties on Zappos! The Shop With Us team may receive products free of charge from manufacturers to test. In addition, Us Weekly receives compensation from the manufacturer of the products we write about when you click on a link and then purchase the product featured in an article. This does not drive our decision as to whether or not a product or service is featured or recommended. Shop With Us operates independently from the advertising sales team. We welcome your feedback at ShopWithUs@usmagazine.com. Happy shopping!